Home » What's New » Contacts Make Adolescents Happy! Requiring glasses is often met with resistance from a teen. The mere thought of wearing glasses can make a teenager go to pieces. As opposed to eyeglasses, kids and teenagers that wear lenses report a significant enhancement in their appearance, says a recently published study. 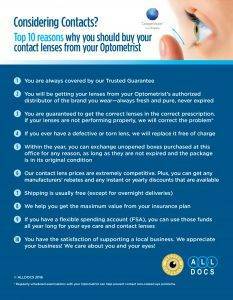 The research results indicate that starting at the age of eight, kids may prefer being offered the option of lenses. Researchers published the study in the November issue of Eye & Contact Lens, the official publication of the Contact Lens Association. What is it about contacts that teenagers like? Teens are self-conscious, and they often feel more positive about themselves when they're not wearing eyeglasses. Lenses can help young adults have a sense of greater self-esteem and more ease around others by providing them a less visible alternative for their vision needs. While teens are frequently provided with contact lenses, children under 13 are typically not given the option of lenses, since eye care practitioners and parents don't believe that children are ready to care for them appropriately. However, with the right instruction, even at age eight, children are just as capable at wearing and tending for contacts and they should be given the option. Of course before your child purchases lenses you should speak to your optometrist to find out about any possible problems your child might have. Our optometry practice located in Philadelphia, PA, can assist you to come up with the right prescription for your teen's contacts. If your pre-teen or adolescent is in need of vision correction, why not consider contacts? Through just a simple contact lens, you can make a world of a difference for your teen. With the large assortment of lenses on the market, you and your optometrist can work with your child to determine what modality best fits their personality, maturity and lifestyle.